4 BEDROOMS, 2 RECEPTIONS, Refitted Kitchen, Utility, Cloakroom, Bathroom & Refitted Master En-suite Shower Room, Driveway, Garage, Gardens, UPVC DG, Gas CH with replacement boiler A modern detached house built by McAlpine with elevations predominantly of facing brick under a pitched tiled roof with UPVC double glazing and gas central heating. The accommodation enjoys refitted kitchen and en-suite shower room, front garden, driveway providing parking for 2-3 cars leading to an integral garage and a good-size enclosed rear garden approximately 38' 0" x 47' 0" (11.58m x 14.33m). The property must be viewed to be fully appreciated. ENTRANCE HALL Understair storage recess, single radiator, part coved ceiling, doors to all principal rooms. CLOAKROOM White suite comprising low-level WC, vanity wash hand basin with mixer tap over and double cupboard under, tiled splashback, radiator, tiled floor and extractor. 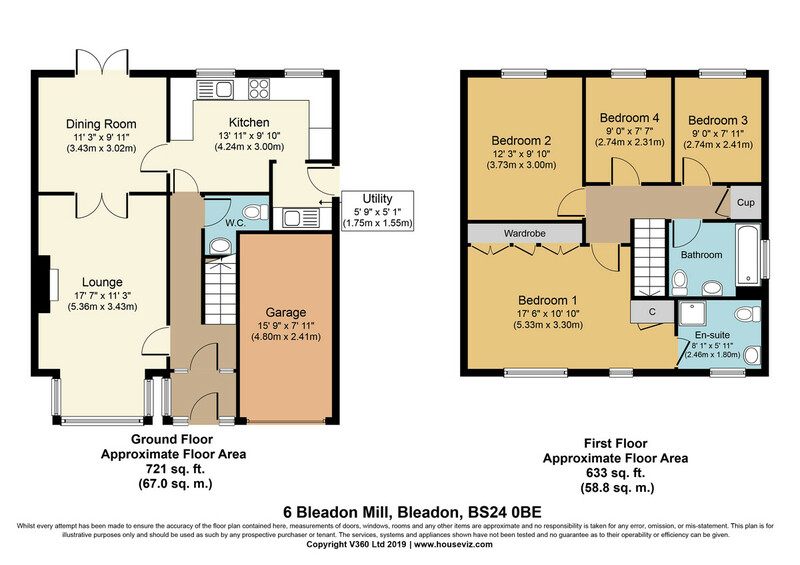 UTILITY 5' 9" x 5' 1" (1.75m x 1.55m) Coved ceiling, single and double wall cupboards, single bowl single drainer stainless steel sink unit with mixer tap over, cupboard under, roll edged worktops, tiled surrounds, plumbing for dishwasher and washing machine, UPVC double glazed back door. FIRST FLOOR LANDING Loft access, shelved AIRING CUPBOARD with radiator. BEDROOM 1 13'11" (4.24m) extending to 17' 6" (5.33m) max. including over stairs wardrobe x 10'10" (3.3m) plus 2 double and 1 single built-in wardrobes, coved ceiling, radiator, TV point, 2 UPVC double glazed west facing windows with views toward the River Axe and fields beyond. REFITTED EN-SUITE 8' 1" x 5' 11" (2.46m x 1.8m) Fitted with white suite comprising vanity wash hand basin with double drawers below, mixer tap over, low-level WC, corner shower cubicle with mains mixer shower unit and glazed sliding screen, fully tiled walls, double radiator, coved ceiling, extractor, UPVC obscure double glazed window to front. BEDROOM 2 12' 3" x 9' 10" (3.73m x 3m) Including double mirror fronted sliding door wardrobe, coved ceiling, radiator, UPVC double glazed window overlooking rear garden. BEDROOM 3 9' 0" x 7' 11" (2.74m x 2.41m) Coved ceiling, radiator, UPVC double glazed window to rear. BEDROOM 4 9' 0" x 7' 7" (2.74m x 2.31m) Coved ceiling, radiator, UPVC double glazed window to rear. BATHROOM White suite comprising panelled bath with Victorian style mixer tap and shower attachment, glazed folding screen, pedestal wash hand basin, low-level WC, heated towel rail, fully tiled walls, shaver socket, extractor, timber effect laminate flooring, UPVC double glazed window to side. INTEGRAL GARAGE 15' 9" x 7' 9" (4.8m x 2.36m) extending to 7'11" (2.41m) with up-and-over door, light, power and gas fired combination boiler providing hot water and central heating. REAR GARDEN 47' 0" x 38' 0" (14.33m x 11.58m) approx. Enclosed by timber fencing and laid to paved patio with outside tap and security light, shaped areas of chipping stones with shrubs, flower bed, level lawn. Timber covered seating area with balustrading with double power point and wiring for 2 wall lights. To the west side of the property is a useful timber shed 11' 9" x 6' 0" (3.58m x 1.83m) with timber door to rear garden and timber door leading to a chipping stone storage area.